The collection grew by a few, as of this morning's UPS delivery, so I thought I'd share a partial update. And, of course, this little army keeps growing. . .
Must be fun being you! and IIRC, all of the sculpts in the first photo were inspired by your work . . ? for my birthday, since I'm an editor and all. IIRC, all of the sculpts in the first photo were inspired by your work . . ? I can't say for sure that Union Jack was, but She-Hulk certainly looks familiar! The rest, of course, are by the Forums own Jim Maddox, who indeed credits me for the inspirational poses, or creation of the character. Very nice collection there. The Bowen pieces are incredible and nearly always seem to capture the classic look of the Marvel characters. 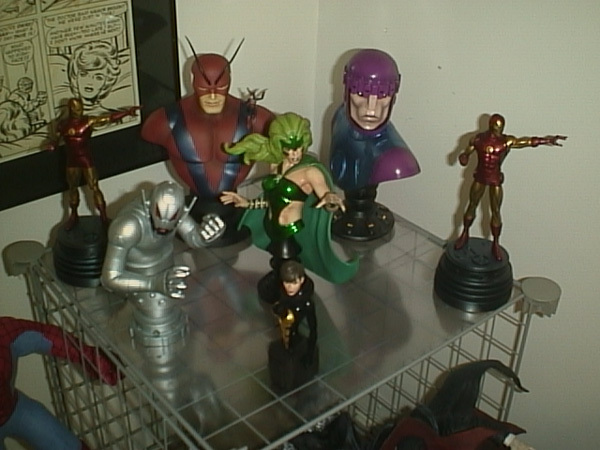 Of the pieces shown above, I also have She-Hulk, the Sentinel, and the two Iron Man mini-statues. The other busts in my collection include the Fantastic Four, Captain America, Guardian, Phoenix, Dark Phoenix and Wolverine in his brown uniform. 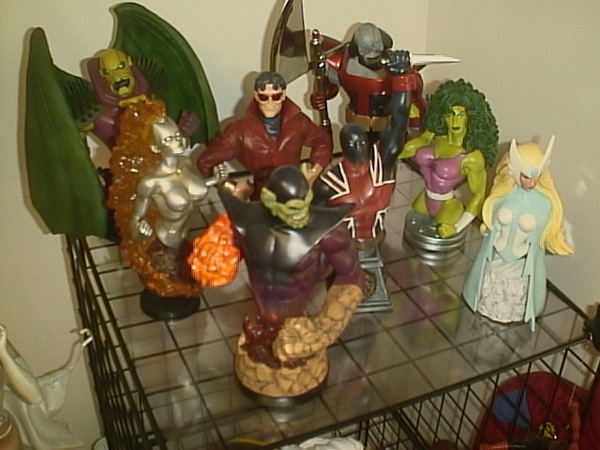 The other mini-statues include Storm, Nightcrawler, Colossus, Dark Phoenix, Hulk, Thor, and Doctor Doom. I'm hoping to add the upcoming Puck bust and the Captain America statue. I also got hooked on the Gentle Giant Star Wars stuff. I almost need a bigger house to display all of this stuff. Nice collection. 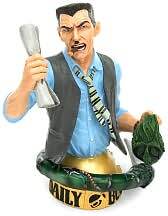 I'm not into collecting figures, but those Bowen sculpts are great pieces. I particulary like Ultron. Is that an alphabetical order on the line-up of the small non-Bowen ones?? And regarding the books on your shelves: you've got a nice architectural reference library in there. They are all very nice JB. Really like the Union Jack bust. Is that an alphabetical order on the line-up of the small non-Bowen ones? Yup. 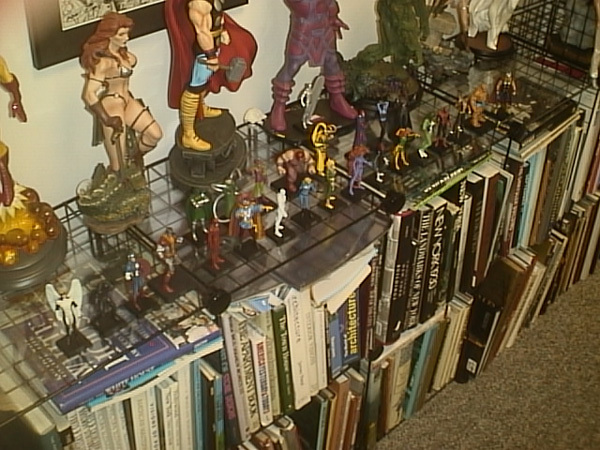 I used to have my Super Powers figures (now retired) lined up the same way, and people -- people who work in comics! -- would stand there for several minutes trying to figure out the reason for the line-up. I'm surprised you got the Mystique figurine, JB. Time to get out the white paint? Nah. She's in civvies. I figure she can wear civvies! Sidebar --- looking at the figures this morning, I was struck that several of the familiar characters are in what would be, to them, civvies. "Street clothes". Or, at the very least, ceremonial garb rather than costumes. Doctor Strange, for instance. Medusa. Iron Fist. Even Thor! Are you able to get a tax break on these,being as they are for reference purposes J.B.? Love that Wonder Man bust. The overcoat and turtleneck have always been my favorite. Are those little figurines from the Classic Marvel Magazine originally published in the UK but now available in the US? Thanks for reposting the link, Ryan. Y'know, every time I see the Wolverine, I wonder if it would be worth the effort of a repaint. Thinking the same about Cyclops, too. Slippery slope, that. Next thing, and I'll be trying to bend Spider-Man and Nightcrawler into more appropriate poses. JB, do you own a copy of How to Draw the Marvel Way? Sorry for the sort of off topic post, but I saw your books and became curious. What are those figures made of? I think I'll be waiting a long time to see Guardian made, if ever. Would it be possible to mod a Silver Surfer, or chop a few of these up to make what I want, like with Heroclix? some of them would customize pretty easily. Thanks JB. I have about 25 years experience painting little lead Citadel figures, so I'm off to spend some money. Thanks for the advice! Other than Captain America and Dr. Doom, the ones I really want aren't out yet, which will limit the bleeding for a while. Love the Iron Man mini statues from Bowen. I wanted the Full Size ones, but they are rare and expensive! I thought he had Playboys on that rack before..I may be wrong. If so I apologize.